Kuebiko, 2016. Done at Stiftung Insel Hombroich in Neuss, Germany. 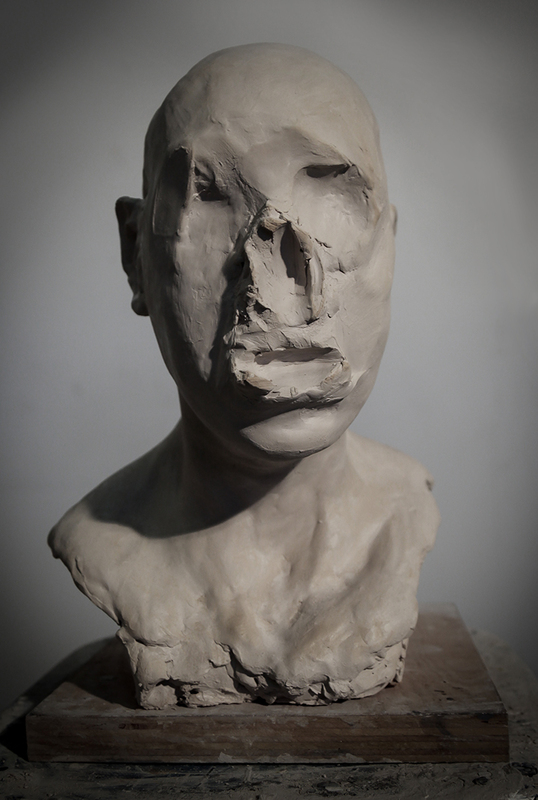 Unfired Clay in wood support, 92 x 54 x 34 inches (233 x 135 x 86.36 cm). Steeping Still, 2016. From the Steeping performance done at Stiftung Insel Hombroich in Neuss, Germany. Coffee on bed bed cover on top of wood frame, 53 x 78 inches (135 x 200 cm). Axes Of Will, 2016. Found object and clay, 47 x 15 x 15 inches ( 119.38 x 38.1 x 38.1 cm). Axes Of Will (detail), 2016. Found object and clay, 47 x 15 x 15 inches ( 119.38 x 38.1 x 38.1 cm). Busto, 2015. Unfired clay, resin and pillow, 15 x 15 x 7 inches (38.1 x 38.1x 16.4 cm). Permanence, 2016. Fabric, cord, plaster and found object, 25 x 20 x 42 inches ( 63.5 x 50.8 x 106.68 cm). Wrong Side Feelings, 2015. Ceramic, metal and nails on wood stand, 16 x 10 x 10 inches ( 40.64 x 25.4 x 25.4 cm). Disambiguation, 2015.Ceramic, 14 x 10 x 10 inches (35.56 x 25.4 x 25.4 cm). Disambiguation ( side view), 2015.